Do you like to have glowing cheeks? Then blush should be a must in your vanity. And if it comes from a widely popular brand like Maybelline New York, you simply cannot help but love it. Nowadays, every other makeup brand is hiking prices like crazy but Maybelline has not done anything like this yet thankfully. Rather, it always offers amazing products at affordable prices. 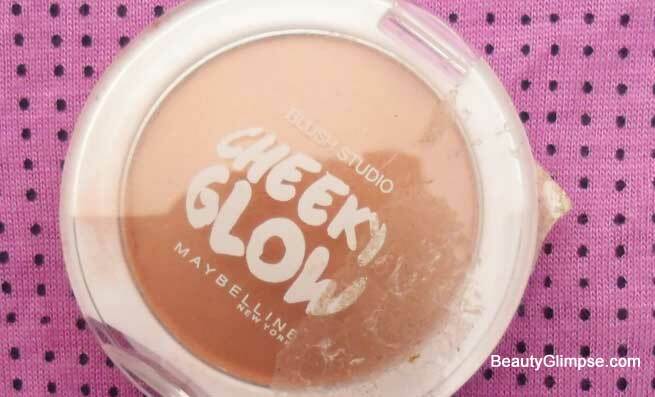 Today, I am going to review Maybelline New York Cheeky Glow Blush (Creamy Cinnamon), which is one of such awesome blushes launched by the brand till date. Let’s see how it worked on me. Maybelline New York Cheeky Glow Blush is the newest and the trendiest blush on the block. It is an ultra-light blendable powder with a very soft texture. It also has an extremely silky and smooth finish that is absolutely natural. Available in 4 variants, this blush blends easily and flawlessly with your skin color to give you the most spectacular look. Maybelline New York Cheeky Glow Blush is packaged in a round plastic pot, which is very tiny and fits in the palm easily. It is a white-colored pot with a transparent flip-top lid and you can easily identify the shade of the blush from outside. 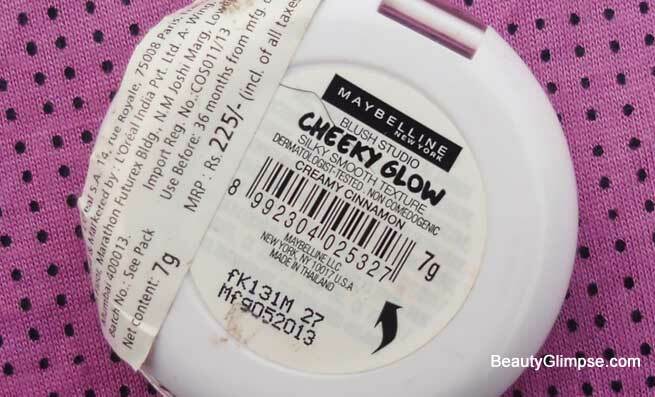 There is a peel-off sticker at the back of the pot, which allows you to take a sneak peek into the list of ingredients used in the product. The packaging is compact, cute and travel-friendly. However, it is not very sturdy. So, you must handle it carefully. However, there is no brush included in the packaging and I don’t have any issue with that as the included brushes are always useless. The mirror is also missing so you need to carry a mirror along with you for touch-ups. Maybelline New York Cheeky Glow Blush is a baked blush, which is proved by its raised dome shape. 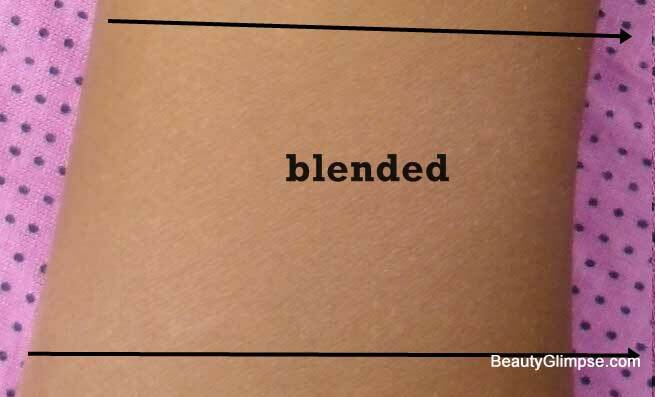 It is a finely-milled product with a very smooth texture that is quite easy and effortless to blend. The product has a silky texture for providing uniform coverage. It also has shimmers in it, which are not at all chunky. Rather, they give a subtle satin finish. The shade from Maybelline New York Cheeky Glow Blush range, which I’m reviewing in this post, is named ‘Creamy Cinnamon’. It is a dermatologically-tested, non-comedogenic product from Blush Studio by Maybelline. The shade is a very pretty peachy-brown shade with sheer pigmentation in it. It is a universal shade that suits almost all skin tones beautifully. I have dusky complexion and this one works really well on me as it looks completely natural. Though the blush looks brown in the pan, it translates into peach on the cheeks with hints of brown in it. In my opinion, it is apt for beginners as well as the pros, who like to have the faintest hints of color on their cheeks. It is a decently pigmented product that adds a mild flush to the cheeks with a beautiful satin-like sheen. Typically, 2-3 swipes of it are enough for my dusky complexion. However, a single swipe may also be visible on your cheeks if you have a fair complexion. The texture and the pigmentation of this blush make it a clear winner for me and I don’t have any issue in this department. Though it is a light and muted color, it is quite easily buildable too. Hence, you can never go overboard with this one, which is definitely a plus. The blush gives a matte finish, which makes it perfect for daytime application. As said earlier, it also contains fine shimmers, which add a nice subtle glow to my cheeks. In fact, this particular shade of the blush is great for every day as it looks completely natural. The staying power of the product is decent considering its low price tag. It usually stays for around 2-3 hours. A primer underneath can extend the wear-time even more. Maybelline New York Cheeky Glow Blush (Creamy Cinnamon) is a beautiful peachy brown shade, which gives a natural matte finish. It is perfect for everyday use as it does not have chunky shimmers. 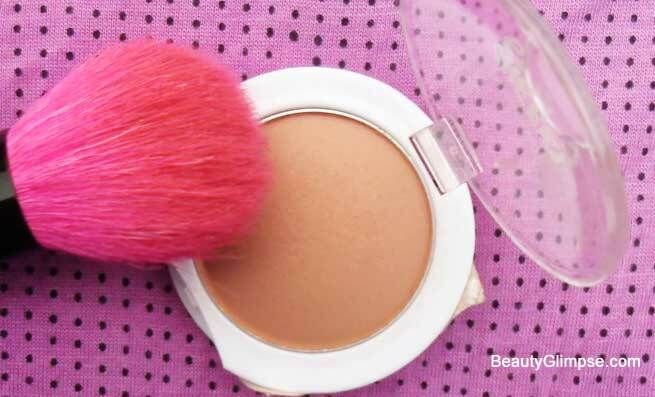 The texture of the blush is smooth; it blends easily, stays for 3 hours (without base), and comes at an affordable price tag… what else can we want? I am very happy with the shade and I’m definitely recommending it to others.